The embattled editor in chief of the Rutland Herald and Barre-Montpelier Times Argus assured employees Monday morning that his family's news organization would survive. "There is a future for these newspapers," Rob Mitchell told staffers at a companywide meeting in the Herald newsroom, according to prepared remarks he provided to Seven Days and other media outlets. Mitchell addressed his employees three days after his father, company president R. John Mitchell, fired Herald news editor Alan Keays for covering the organization’s ongoing financial troubles. As the Herald itself reported last week, freelancers have gone weeks without pay — and staffers have seen their paychecks bounce. The younger Mitchell acknowledged the turmoil Monday, calling it "embarrassing, humiliating and difficult.” While he said that all employees had since been paid and their expenses reimbursed, he did not indicate whether freelancers had been made whole. Mitchell, who was accompanied by his father and publisher Catherine Nelson, also did not explain what caused the late payments — nor did he provide details about the company’s financial health. "While it may look bad from the outside, it's not as bad as it looks," Mitchell said in what staffers described as an emotional meeting. Several writers and editors threatened to quit the Herald on Friday after the elder Mitchell terminated Keays. Some spoke up at Monday’s meeting and argued that the move had diminished the paper’s credibility, according to those present. It was unclear whether the company was considering rehiring him, nor whether he would accept such an offer. Keays himself broke his silence Monday morning in an interview with Vermont Public Radio’s Mitch Wertlieb. Later that day, he described his firing to Seven Days. Keays said the company’s president and publisher called him into the office Friday afternoon following the paper’s publication of a story documenting its financial troubles. "John expressed displeasure with the story, and I said I planned to do another story," Keays recounted. "He said there wouldn’t be another story. I said, ‘Yes, there would be.’ And eventually it got to the point where I was fired, as I continued to advocate for a follow-up." Keays worked as a reporter for the Herald from 1995 to 2000. After a brief stint at the Portsmouth Herald, he returned in 2001 and became an editor in 2006. He argued that it was important for the paper to hold itself accountable. "I think because we’re going to hold other institutions and entities to a standard, we need to meet that standard ourselves," he said. Keays thanked his former staffers for going to bat for him and said, "They deserve the community’s support." He wouldn’t say whether he would consider returning to the paper if asked to do so. "I don’t know if I can answer that right now," he said. As of Monday evening, neither the Herald nor the Times Argus had reported Keays’ firing, though most major news outlets in the state had. Sources told Seven Days Monday that the papers plan to publish a follow-up story about the situation soon. I want to first of all acknowledge that this has been a very difficult few weeks for all of you and for these newspapers. The uncertainty has weighed on all of you, and on us. You may wonder why we have rescheduled this meeting repeatedly. The simple, honest answer is that we have had a lot of work to do, each and every day, and wanted to ensure that any information provided to you was accurate. Our priority through all of this has been to preserve these newspapers and to make sure that our employees are paid, and we meet our obligations. We have worked tirelessly on that and have done that. Yes, several employees had manual checks bounce. As was reported in the story Friday, we have been late paying expenses, and we have been late paying freelancers. None of that has been easy for you, for our drivers and it has not been easy for me or my father. I walked over to the bank with several of you to make sure you got paid. We have written letters for employees whose checks bounced, to make sure that your banks know that it was an issue between the newspapers and our lender, not your fault. Personally, this has been embarrassing, humiliating and difficult, as I'm sure it has been for many of you. If you are having any additional difficulties, you need to bring those directly to our attention in a one on one basis so that we can address those issues directly with our lender. We are all tired, and if you're like me, you've lost a significant amount of sleep. But all our employees have been paid, and employee expenses have been paid. While it may look bad from the outside, it's not as bad as it looks. At this point, there are still things we can't talk about, for a variety of reasons. Rather than focus on what we can not yet openly discuss, I am going to try to focus today instead on what we can talk about – the overall direction and the future of these newspapers. There is a future for these newspapers. The context to where we are right now is important. We started this year with a general plan that is designed to bridge our newspapers to the digital world. It's no secret that these newspapers and newspapers everywhere have had major, life-changing challenges. On top of this transition, we've had to deal with a flood that destroyed our press and a lot of other problems that are out of our control. It has always been my family's intention to do whatever possible to ensure these newspapers make the transition to a new business model. We have worked on this plan over the course of the last few years, and have started putting it in place. In March, we launched the Business Vermont web site, an online iteration of the New England Business Journals. In May, we reconfigured and improved the Sunday newspaper, and launched our first consumer-focused mobile app, Go Rutland. 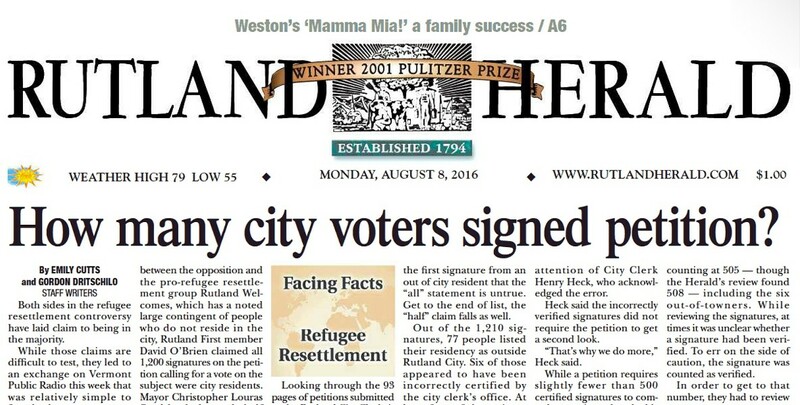 In July, we moved to four days of print publication. We have started a web site redesign that will allow for a modern news workflow. None of these things were or are easy to pull off. We've accomplished much with your support, your hard work, your diligence and our shared belief that we are here because the mission of the Rutland Herald and Times Argus is important. It's important for all of us to keep that in mind. 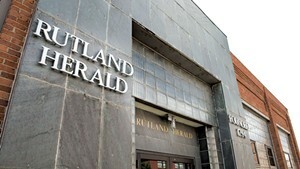 My family has been a part of the Rutland Herald since 1935. We've been a part of the Times Argus since 1964. These newspapers have had hard times, and have had good times in those years. Through it all, the newspapers, and I believe, my family, have established a long track record of standing for the principles of free speech, government transparency, and of taking principled, public stands on issues that matter to the community at large. That has not changed – it will not change. What is at stake right now is whether we can prove that a strong, community-oriented news organization can and will continue. I am here because I believe it will, and my career and my heart are dedicated to figuring that out.